There comes a time in any garage door's lifetime when replacement is going to be due. But sometimes, there are reasons to consider getting a new system in place of your current one even if it's still functioning semi-decently. Of course, if your door is getting on in years, getting a new door installed can make a significant improvement to your daily routine, and it'd be worth your time to consider what options are available to you. Before buying a new system, there are several factors that need to be considered. For once, the material it will be made of, as that will determine what its insulating qualities will be, as well as its weight and durability. Wood is often a great choice, due to its natural insulation and classic curb appeal look, although it does require some extra maintenance. Steel is very strong and capable of withstanding significant impact, but it is susceptible to rust, and won't necessarily be a perfect choice for moist climates. Our team can guide you through the many different options and help you find the perfect door for you. If it's an entire system that you're looking to replace, then picking the right opener for your specific needs can be a real hassle. There are many name brands out there, each with its own series of distinct models. Our experts can consult and advise you on which opener will likely be the best choice. From the strong but also loud chain-drive models, to the silent and smooth, albeit more expensive, belt-drive ones. Count on us to find the perfect unit to suit your needs. Another aspect of choosing a new automatic door system is the various safety and security features that are available today. From WiFi compatibility to rolling code technology and more. The options are plentiful, and our team can explain each one in great detail. 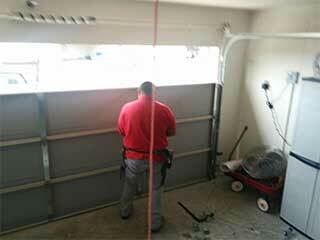 Our experts at Garage Door Repair Encino are always here to help. You can count on us to offer you informative and useful advice on any and all garage door related subjects. We also offer a variety of other services, ranging all the way from maintenance to repairs. Call us today.